The old year shows no signs of slipping quietly and peacefully away. As I write, the north west of England is taking stock of damage and starting the clean up operation after the devastating floods which struck the area in early December. And with more rain forecast, the region’s problems may not yet be over. If there is anything positive to take from the situation, it is the evidence of rural communi-ties’ willingness to help others and their own; yet again we see images of tractors ferrying people and their possessions to safety and hear of farmers in unaffected areas, often many miles away, joining forces to provide emer-gency fodder or housing for livestock. Some might say our sense of community is diminish-ing in today’s increasingly technological world, but I would contend it is alive and well in the countryside and within the farming industry in particular. Long may that be the case. Before writing this editorial I took a look back over the front pages of Arable Farming’s sister publication Farmers Guardian’s front pages for the last 12 months and came to the conclusion that, for agriculture, it’s been a year of politics and prices. Basic Payment Scheme troubles, questions over the role of AHDB, Defra cuts, Europe and tumbling prices have grabbed the headlines on numerous occasions, with only a bumper harvest providing respite. Most of these issues, I feel sure, will be making the front pages well into 2016.
goes without saying steward-ship and a commitment to good practice should be at the forefront of everyone’s minds. It has been a busy time for us recently in terms of industry events. 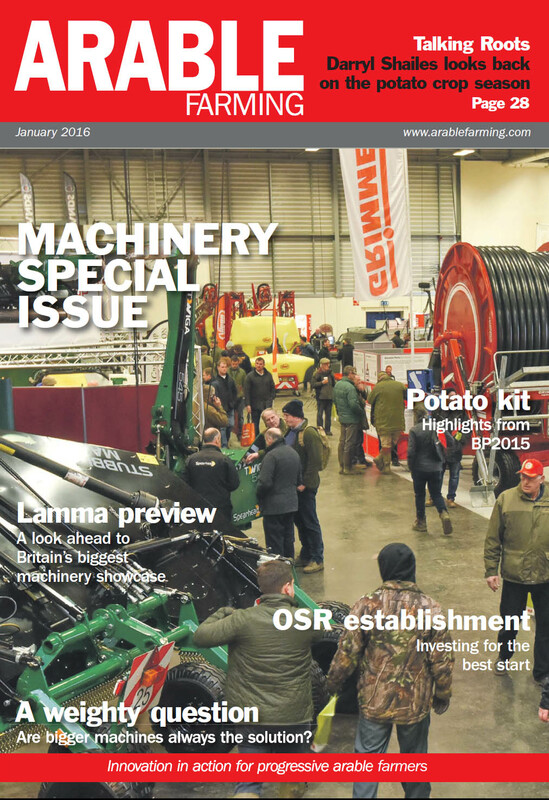 No sooner had we closed the doors on a very successful CropTec, than it was time to put the finishing touches to our Lamma’16 preview ahead of next month’s show. We hope this special machinery issue will whet your appetite ahead of the UK’s leading agricultural machinery showcase. Teresa Rush, Arable Farming editor.